UPDATE (3/21/2019): On Jan. 15, a federal court blocked the Trump administration from adding a citizenship question to the 2020 census, stating that it constitutes an “egregious” violation of federal law. Judge Furman concluded that if the Trump administration got its way and a citizenship question was put on the census, “hundreds of thousands—if not millions—of people will go uncounted.” The Trump administration has appealed the ruling and the Supreme Court has agreed to hear the case. The ACLU will appear before the Supreme Court on April 23, 2019. 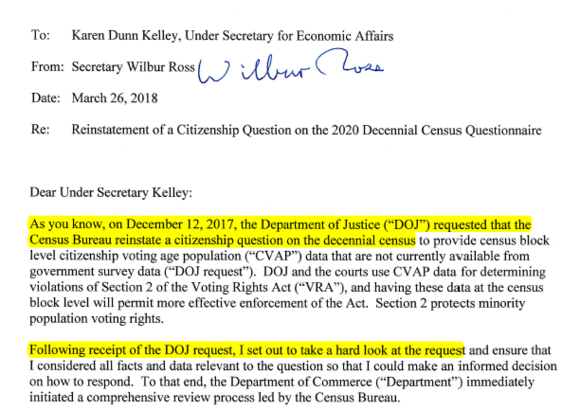 Last month, we challenged the Trump administration’s decision to add a citizenship question to the 2020 Census — essentially a door-to-door federal inquiry of the citizenship status of every member of every household in the country. On Thursday, we received welcome news from a federal judge that the lawsuit can continue. The judge’s decision, in part, was based on an explosive set of documents we obtained from the government. These documents reveal that the Trump administration’s public explanation as to why it needs this information is a sham to conceal its discriminatory, anti-immigrant agenda, and they also prove that a prominent member of President Trump’s cabinet lied under sworn oath to Congress. Some background: Every 10 years, the federal government conducts a census to count all people in the United States. Everyone is counted without exception — adults and children, citizens and non-citizens alike. This total population count is used to allocate funding for various federal programs and to apportion representation in Congress, the Electoral College, and within state legislatures. Earlier this year, the Trump administration announced that it will include a citizenship question in the census questionnaire being sent to every household in America for the first time in 70 years. The White House persists, despite unanimous opposition from experts warning that such a question will intimidate immigrants and deter participation in the census in communities of color, costing these communities critical resources and political representation. Documents uncovered in our case have revealed that attacking immigrant communities is, in fact, the administration’s goal, spearheaded by two of President Trump’s most prominent anti-immigrant ideologues, and that Commerce Secretary Wilbur Ross lied to Congress in an attempt to cover up this fact. Here’s the official story, according to the Trump administration, of how a citizenship question came to be added to the census, in three parts. But that isn’t how things played out in the real world. The reality, as revealed by documents we’ve obtained through our litigation against the Trump administration, is very different from the official version of events, and it suggests that Secretary Ross deliberately misled Congress about his decision-making process. 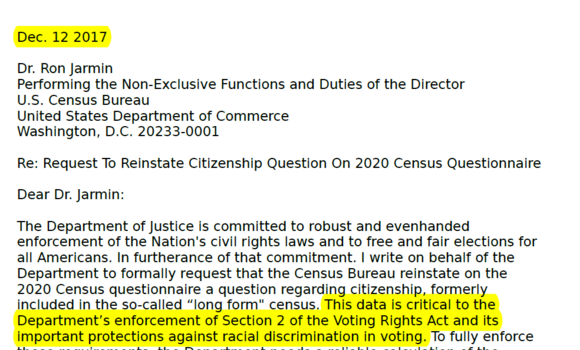 In fact, discussions of citizenship and the census occurred many months before the December 2017 letter from the Justice Department — and for purposes that have nothing to do with protecting communities of color from voting discrimination. Next, about one month later, on April 5, 2017, Secretary Ross’s executive assistant emailed Secretary Ross’s wife to set up a call on behalf of Steve Bannon, who “asked that the Secretary talk to someone about the Census.” The “someone” went unnamed in the email (but stay tuned). Two months later, Secretary Ross received an email, solving the mystery of whom Steve Bannon sent to talk to Ross about the census. It was none other than the Kansas Secretary of State Kris Kobach, who has long pushed an anti-immigrant agenda. A month later, the pressure appeared to have paid off. 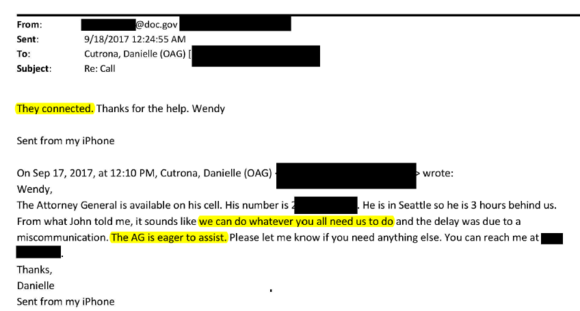 On September 18, a Justice Department aide wrote to Commerce official Wendy Teramoto stating that “we can do whatever you all need us to do…. The AG is eager to assist.” [Emphasis mine] Ross and Sessions then met. 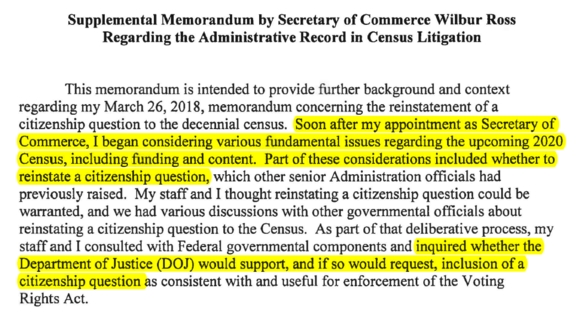 The following month, in December 2017, the Justice Department finally sent its request to the Commerce Department, which supposedly “initiated” the process of considering the addition of a citizenship question to the 2020 census. 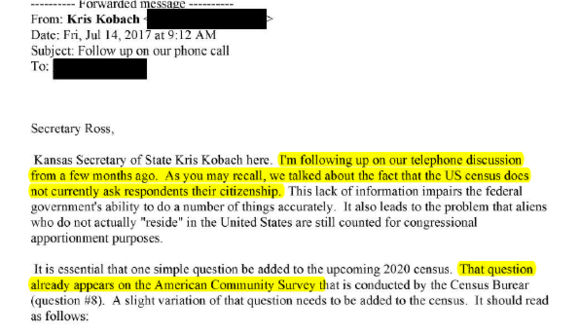 In April 2017, Kris Kobach, at the direction of Steven Bannon, pitched the idea of the citizenship question to Ross. In September 2017, the Justice Department assured Commerce “we can do whatever you all need,” leading to a meeting between Sessions and Ross on the issue. 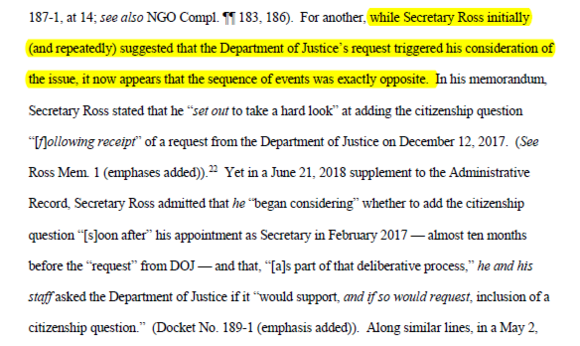 But thanks to the documents uncovered through our litigation, Secretary Ross has been forced to admit that the Trump Administration’s official narrative for how citizenship became part of the Census was false. In a June memo, he now admits that he started the process of adding the question “[s]oon after my appointment as Secretary of Commerce,” essentially admitting that he misled Congress. Our case will now proceed, with the trial likely in late October or early November — right before the midterm elections. We’re not tired of winning. See you in court, again, President Trump. * This case is being brought by the ACLU, NYCLU and the law firm Arnold & Porter, on behalf of the New York Immigration Coalition, Make the Road NY, CASA, and the American-Arab Anti-Discrimination Committee. At this stage in the litigation your article is nothing more than a smear campaign, probably Co-authored with David Brock of Media Matters or one of his staff. Shame on the ACLU for joining the lynch mob undermining the president and our country. Really? You think the emails, drafted by the Trump administration are “a smear campaign” against the president? Come on, even *you* have to be smarter than that. Why lie about something the Trump administration has already admitted to being caught at? The article presents documents and facts directly from the administration and the court. Surviving a motion to dismiss is an important step in litigation, regularly leading to a settlement. This is not a smear campaign. This is a success story, based in facts, that has revealed the real reasons for the citizenship question, which a federal judge has now recognized. This comment further demonstrates that 1 out of 3 Trump supporters is just as stupid and racist as the other two. This comment further demonstrates that 1 out of 3 Trump supporters is just as stupid and racist as the other two. Thank you ACLU for always seeking the truth and supporting the rule of law and the Constitution. Just read the article, open your brain and see the true reality of Trump's government lies to the country. So you are okay with the president lying! Notice that was a statement not a question. No one needs to undermine trump he does it to himself. No one has to work at undermining Dump. He is constantly busy doing that himself. If it wasn’t for the complicit weak congress, who can’t figure out how to govern even as the majority in every branch, and the compromised willfully ignorant base they cater to he would never be in the office for which he is so completely unfit. Serious Anonymous? Serious? The shame is reflected off of these complicit, corrupt, Russian-aligned, GOP obstructionists in our State government, Congress AND the entire Administration including this presidency. NEVER, EVER has this country seen the blatant contempt for the law that we witness DAILY. If they (the GOPs) are not running up and down the Hall's of Congress trying to discredit the Mueller Russia investigation with false narratives, they are making midnight runs to the White House carrying evidence to assist in a cover-up, or they are in violation of the Emoluments Clause every. single. day., to stomping all over Democracy and our living Constitution, lying about our press, Justice Department or anything else that does not sit well with this over-grown baby/man-child who has lived his entire life bullying people and uses his worldwide standing as a platform to discredit and attack our allies yet kisses our foes feet! This obscene bunch is a mob worse than any corrupt Italian mobs we have dealt with in past decades. No, the ACLU has not joined any "lynch mob to undermine this president and our country"; rather this president, his Cabinet, and the "Good 'ol boy network" works 24/7/365 to undermine our country at the risk of our Democracy. For anyone to think any different is just as complicit and corrupt as the GOP bunch I have described/outlined above. One of the saddest parts about this entire fiasco is that the Tea Party/Freedom Caucus/Evangelicals who penetrated the GOP have the nerve to say they are Christian's and the old guard GOP stands idle and complicit. I'm a GOP from the 60s, 70s, 80s and 90s. They have always had an arrogance that their crap didn't stink. When I walked away, after the 1st "W" term, I never looked back because it was no longer the party I recognized who worked well across the aisles with others. Instead, this bunch is an embarrassment who can not get elected on their own merits anymore without redrawing district lines to give them an edge over any others running against them. They now rule like a Banana Republic instead of considering WWJD? Indeed, the shame is on them and the disgusting displays they make daily--SMH--are far worse than even Nixon. The shame is on you Anonymous and those like you who follow down behind a downtrodden Party. Shame on you! Trump Says 58,000 Texans Voted Illegally. Here's What Actually Happened.